Piano – Find a good teacher, listen to what they say and actually do it. Yes, even if you’re an adult. Even if you think you’re already pretty good. If you want to get better you need someone with more knowledge to help you improve. But above all, you have to practice. A lot. Sometimes you may have to miss out on fun things because you have to practice, but if you really want to learn how to play the piano well it is necessary. Often after I give out my advice on how to start and/or how to improve on these skills people push for different advice. They’ve heard all this before. It’s nothing new, it’s nothing exciting, it’s just the same old stuff people have been saying for ages. The key to both things is to actually do it. Even if you have talent in these areas, you won’t be good unless you actually do it. You don’t get better at the piano by just sitting on the bench and you don’t become a better runner by just buying running shoes. You have to actually take action. The gospel is the same way. How often do we we hear the “Sunday School Answers” and discount them because we’ve heard them a million times already? Pray, read your scriptures, go to church, etc. Here is the sure-fire method of building a testimony and becoming truly converted: You get down on your knees and say your prayers. You open your scriptures and actually study them. You go to church and actually worship. Knowing these things does not accomplish them any more than being talented makes you a good pianist. It doesn’t matter what natural tendency you may have to be good at something, it is only untapped potential until you work your tail off to actually accomplish it. Let’s talk about Alma the Younger. His is the classic story of “instant testimony.” As a younger man he and his friends, the sons of Mosiah, persecuted believers of the church and lead many people astray because of their actions. Alma the Younger’s father, Alma the Elder prayed his heart out for an indeterminate amount of time until finally, a miracle happened. 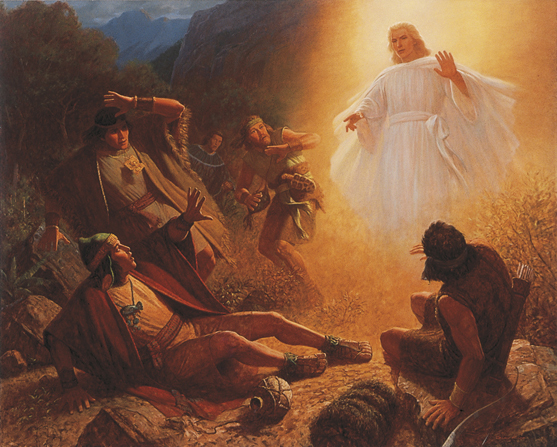 An angel appeared to Alma the younger and the sons of Mosiah and they changed their lives! Wow – don’t we all wish we could have such experiences so we too could be as great as Alma the Younger ended up being? Alma fasted and prayed many days so he could know these things. He does not even mention the angel. The angel urged him to repent, and he did, but his testimony came to him just as it will come to us, by actually doing the same things we’ve heard over and over again. I would exhort you that if ye would ask God, the Eternal Father, in the name of Christ, if these things are not true; and if ye shall ask with a sincere heart, with real intent, having faith in Christ, he will manifest the truth of it unto you, by the power of the Holy Ghost. And by the power of the Holy Ghost ye may known the truth of all things. The Lord has told me to ask the Latter-day Saints a question, and He also told me that if they would listen to what I said to them and answer the question put to them, by the Spirit and power of God, they would all answer alike, and they would all believe alike with regard to this matter. That is pretty confidant – to say that if we all ask we will all get the same answer! Wow. Sure, this paragraph was pertaining to something different, but the promise holds true regardless. If we go and do the things the Lord commands (1 Nephi 3:7) we will gain a testimony and become truly converted. Guaranteed.